This formula works for me, but I can’t promise that you’ll have the exact same results. This is not a typical online digital product launch strategy that you might hear traditional online marketers talk about. While I’m sure those strategies might work for a lot of products, launching a Udemy course is a different beast because of the prevalence of deep discounting. I have taken some of the strategies from traditional online marketing, and have implemented it in this blueprint. You need to have an amazing course to launch for this to work. That means high quality, good topic, great pedagogy. My latest course launch made $4,000 net revenue in the first 24 hours, $7,000+ in the first 7 days. A lot of this has to do with me having over 125,000 students in my current Udemy courses that I can send promotional announcements to. That being said, this strategy should work for anyone with a smaller audience – the results just might be proportionally smaller. Let’s get on with it. The way this blueprint works is I’ll give you a countdown of days and tasks leading up to the course launch. If, and only if, you complete all of these tasks will you have the most success. Depending on how long it takes you to create a course, now is the time to record, edit, and polish your course. For some people, you might need to start this process a lot longer before 30 days to launch. For some of you, it might take less time. The point is that you need to be finished with all of your course content with two weeks to go until launch. Need help with course creation equipment? Read this guide. Create your course content (lectures, videos, quizzes, etc.). Design your course image (this will be used for a number of promotion tactics). With 18 days until launch, you should be uploading your course lectures to Udemy. Make sure that your course flows well, starts off with quick-win lessons, and has practice exercises. Upload all lectures to your course on Udemy. Create practice exercises for your course that get students to take action. For the next few days, you need to focus on adding amazing metadata (descriptions, subtitles, course goals) to your course. For titles and descriptions, make sure you include important keywords and that it explains what the student will achieve with your course, and not just what is being taught. For example, a good title is Long Exposure Photography: Shoot Your Own Stunning Photos. A bad title is The Long Exposure Course. Make sense? Perfect your course title & subtitle. Write out an amazing description. Record and upload a promotion video (I use this formula). With two weeks left before your course launch, you should be ready to hit the publish button on Udemy, when the time comes. Now it’s time to really start focusing on promotions. One of the key strategies for my latest launch was giving away free previews of the course to spark interest in the paid course. This included posting a free course on Udemy, a free self-hosted course on my site, and free videos on YouTube and Facebook. By putting it on my own site, I could gather student email addresses who sign up for the free course, then promote the paid course to them on launch day. I use Teachable to host my own courses. By putting videos on YouTube, I can direct people to sign up for the free course on my site. Watch an example. Even though I can’t send promotional announcements to students in the free course on Udemy, it’s still a good way to get more students in your courses who might end up on your instructor profile and check out your paid courses. Also, by using the bonus lecture in the free course, you’re able to promote your paid course to your free course students. We’ll be launching the free courses and free YouTube & Facebook tutorials with 7 days to go, so now it’s time to prepare these videos. Choose 6 lessons from your course that can make up a free preview course. They should be around 30 minutes in total running time. Upload your lessons to a free course on Udemy. Use Teachable (or a similar platform like Thinkific or Patience) to self-host a course. You can start with any of these platforms for free. I like Teachable because it includes a Udemy Import feature that allows you to import your entire Udemy course into your own site with the click of a button, which you can do after you upload and publish your free course. Create a course image for your free course that is similar to the paid course, but different. Record a promo video for the free course (make it generic so you can put it on the course hosted on Udemy and your self-hosted course). With just a little bit of time before we start promoting our free content, we need to get everything set up and scheduled on YouTube & Facebook. I think it’s nice to have a little announcement video that announces the free series of videos you’ll be publishing, as well as hints at the launch of your new course. Some of you may not have a YouTube channel or Facebook page for your brand. That’s okay, but now it’s time to start one. You can also use your personal Facebook page, but I think it’s better and more professional to have a brand page. Record a free course promo video for YouTube & Facebook (example). Make them specific to your YouTube and Facebook audience, for best results. Upload and schedule your videos with one video being published each day leading up to the launch. Hit the publish button on your free preview course on Udemy. We want to make sure that it gets through the Udemy approval process by the time we start promoting the free course with 7 days to go. At this point, our three courses should be posted online. This includes: the free preview course on Udemy, the self-hosted free preview course, and the paid course on Udemy. The last one isn’t published and public on Udemy yet. Also at this point, we should have videos scheduled to publish during the 7 days leading up to our course launch on YouTube & Facebook. Now it’s time to make sure that our funnel will work. On every YouTube video, there should be a link at the top of the description prompting people to enroll in the free course (see example). I also include a YouTube Card that pops up at 5 seconds that links out to the free course. Also, make sure that your YouTube thumbnails look good, using the same branding as your courses (this means using the same colors, fonts, logos, etc.). Make sure you include links to the free course in your YouTube & Facebook video descriptions. Make sure that the free course on Udemy is approved. Write an article announcing your free course, and schedule it to post with 7 days to launch. Time to get excited! 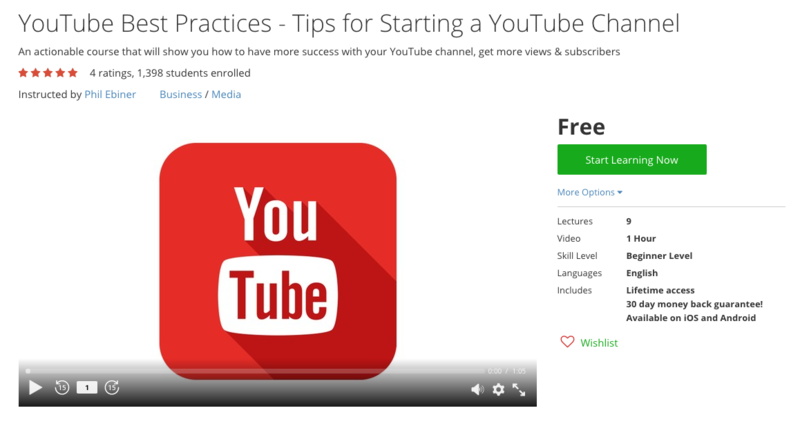 Today, your first YouTube & Facebook video should publish, promoting the free course. If you set everything up automatically, you don’t need to do anything other than make sure it’s published and the links are working correctly to your free preview course. The article that you wrote to promote your free course should be live as well. Make sure there is an enroll now link in this article so people can sign up for your free course. Over the next week, one video will go live each day on YouTube and Facebook. You should start to see students enrolling in your free preview course(s) on your site and Udemy. If things are going slow, reach out to blogs in your niche and send them the link to your YouTube videos and your free preview course. Also, post these links in groups related to your niche on Facebook and Google Plus. This is also the time to publish your paid course on Udemy, to make sure it gets through their approval process. It’s okay if it gets approved early. This is much better than it not getting approved in time. Depending on how fast your previous courses have been approved, you might want to publish earlier (if you typically need to make a lot of changes). Make sure that your article and videos published. Double-check to make sure your videos will be published daily on YouTube and Facebook over the next week. Hit the publish button on your paid course. Everything should be running smoothly and automatically at this point. Now it’s time to think about a Udemy promotion strategy for launch day. Right now, you have your paid course promo video scheduled to publish on YouTube and Facebook on launch day. Now you need to write copy (text) for your Udemy promotional announcement, email announcement (to your email list), and email to students enrolled in your free preview course. I haven’t mentioned having an email list up until this point. Most of you probably haven’t started an email list on your website yet. If you have, kudos to you – you’re doing better than most other Udemy instructors. It doesn’t matter how big or small your list is. Like the number of students I have on Udemy, my list has grown over the past three years, and as it continues to grow, I have seen course launches do better and better. When launching a Udemy course, you have to think about pricing. Will you launch at a discount? How much will you discount? How much is your standard price? We could do an entire guide on how to price your courses. But what I’ve found is that the price of my course doesn’t have much effect on my launch promotion. I encourage people to charge a premium price for their courses (between $97 – $297). But for launches, we’ll be doing some discounting. The key things to remember for selling a course through an email are: there has to be some sort of limit to getting the course; and there has to be urgency to purchase. This could mean a limiting the number of coupons available. Or this could mean a limited amount of time to purchase at a certain price. I combine these with a promotion that has tiered pricing, with limited coupons, AND a deadline. Sometimes I do a $29, $39, $49 tier. But lately, I’ve found the $19 starting price does better. Note: I created unique coupons for each of the places I promoted. This way, I can see where my sales are coming from. For example, I created different $19, $29, and $39 coupons for each of the following places: Udemy promo announcement, my email list, the students in my free preview course, YouTube, & Facebook. In fact, with my latest course, I co-instructed it with another instructor who used their own coupons during our launch. So in total, we had 21 different coupons for this launch. Segmenting is important to understand how well your promotions actually did. I created two animated GIFs for my latest course announcement. It’s hard to tell if these had any effect on whether I sold more courses or not. But it is a cool way to promote a course in an announcement or email. Notice how I used the Udemy green to make tie in the branding of Udemy. Tailor this message to your different audiences (Udemy, email list, members of the free preview course, Facebook, YouTube), and make sure you are using the right coupon codes for each. Today is a simple day. You’re going to give out free coupons to your paid course. I post them to the Udemy Studio Coupons file asking for any advice to improve the course. It’s up to you to decide how many free coupons you give out. There’s balance between the benefit of getting students in your course to show social proof to potential buyers, and the negative of giving away free coupons to students who might not actually engage in your course (and therefore won’t help your course rise the rankings of Udemy search). I generally give out between 100 – 1,000 coupons, depending on the course. Make sure these coupons expire the day before launch. You don’t want anyone that is willing to pay for your course to find these free coupons available. Note: Everyone has their own opinion about whether to give out free coupons or not. I’ve found that giving away free content has always helped me grow my brand. So I suggest giving out free coupons, especially if you are a beginner. With just a few days until launch, people should be signing up for your free preview course. Your paid course should be approved by now. You should have all of your promo copy ready to publish on launch day. Now it’s time to schedule everything you can to make launch day as smooth as possible. Create and schedule your email announcement to your list. Whether you’re using a tool like AWeber, MailChimp, MailPoet, ConvertKit, etc, you should be able to schedule an email. Use the copy that we wrote a couple days ago. Add the copy that includes links to your course to the course promo videos that will be published on launch day on YouTube and Facebook. Write a blog post and schedule it to post on launch day. I usually just use the same copy that I send to my email list to make it easier. Wow, you’ve done a ton of work so far. Everything should be ready to go live tomorrow. You have a series of videos that have been posted on YouTube and Facebook. These videos are driving students to enroll in a free course self-hosted on your site. Students are hopefully signing up for the free course on Udemy. You have an email ready to send to your email list. You’re ready to send a promotional announcement to all of your students on Udemy. And you’re ready to send an email to all of the students in your free course (fyi. using Teachable, you can send an email to all the students in your free course, but you can’t schedule it). Make sure your email to your email list is scheduled to publish, with the right coupon codes. Make sure your promo videos are scheduled to publish on YouTube and Facebook, with the right coupon codes. Make sure your blog post is scheduled to publish tomorrow. Make sure that you have all of the images and copy that you’ll need for your Udemy promo announcement and email to your free preview students. This is it. It’s the day you’ve been waiting for. If all goes well, you’ll see some sort of return for all of the hard work that you’ve put in so far. I prefer to try to publish all of my videos and announcements at the same time. So if you want to do the same, make sure your videos and emails are scheduled to publish right when you send your Udemy announcement and email to your free preview students. I don’t have a secret day or time that I launch courses. I’ve heard that Thursday evenings are good. I’ve also heard that Monday afternoons are good. I’ve heard that weekends actually do well with Udemy students. And I’ve heard that weekends are terrible. In the end, I don’t think the day of your launch is the most important thing. I believe doing everything that I’ve said in this blueprint will help you succeed no matter what day you launch. After you’ve done all of these tasks, try to spread the word as much as possible. Share your on your personal Facebook page. Post on Twitter about your course, linking to your promo video and or article. Post your article to Google Plus groups, Facebook Groups, Pinterest boards. Reach out to blogs and see if they’ll post something about your course. See if any other YouTuber, online course creators, etc. will share your post. Note: I didn’t do any of this for my YouTube course launch. So it’s not necessary. But it would help. With 24 hours left in your promotions, send out another email/promotion blast that states there are only 24 hours left to get the introductory price. After that, the price will jump to the normal price of $297 (or whatever price you set). This always tends to get a few more sales from people who didn’t see the first email. In the YouTube Masterclass launch, this follow-up promotional announcement led to approximately $750 in additional net revenue. On Udemy, this means either saving your 2 monthly promotional announcements for a launch, or running your launch at the end of a month so you can use a 1 promotional announcement from either month. If all goes according to plan, you should see some sort of sales coming in within the first hour after your promo announcements are live. I can’t promise you will have sales. I can’t promise you’ll make $1,000 or $10. But I can promise that doing all of these tasks and following this blueprint will give you a great chance at having a good launch. 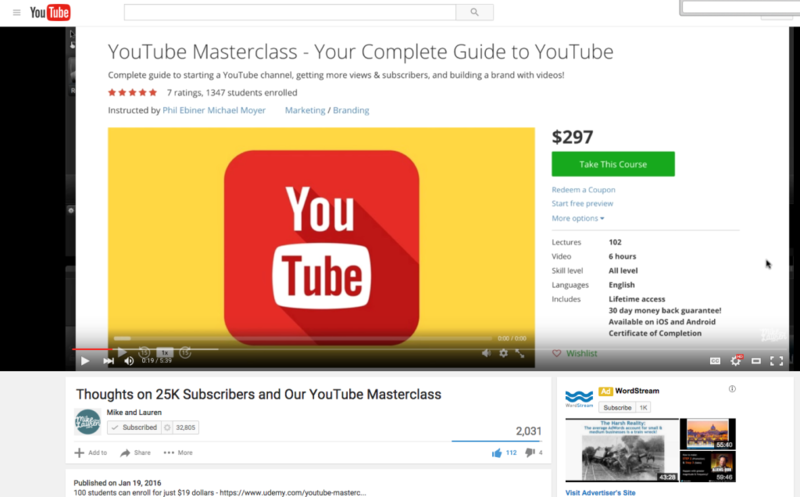 Here are my results for the YouTube Masterclass launch (done in January, 2016). 95% of this revenue came from the promotions that we did. The beauty of all of this promotion is that now our YouTube course is ranked 2nd when someone searches for youtube on Udemy. We’ve already seen a number of organic sales come in, most likely because of this. For us, our most successful promotion strategy was our Udemy promotion announcement. Getting over 100 sales within the first hours was amazing. This was the fastest that any of my coupons ran out, and the Udemy announcements consistently provide the biggest number of sales. Having an email list is also important. 11 sales is a fairly solid number of sales, considering a lot of the same people that got my list email are also getting my Udemy announcement. The best thing that happened for me this launch was creating the free preview course and promoting to those students. With just about 100 students enrolled in the free course at the time of our launch, 5% purchased the course. I can continue to drive traffic to this free course, and promote the full course to them as well. If I can have a 5% conversion rate on students who enroll in that free preview course, I can eventually run advertisements driving more and more traffic to the free course. Then I can promote to them and still come out positive. On YouTube and Facebook, I had minimal success. But for just a little bit of effort, I was able to make a few sales. These videos will be on Facebook and YouTube forever, hopefully leading to more long tail sales. Obviously, having a co-instructor helped with this launch. Without them I would have made about half of the total revenue because they made over 100 combined sales with their email list, and on their YouTube channel. The key thing to know is that Mike & Lauren had never created a course before. This is the first time they did a product launch to their audience. With a little over 2,000 email subscribers and 30,000 YouTube subscribers, they did very well with their own audience. Without me, Mike & Lauren would’ve made over $2,000 with their first course based off of the sales from their YouTube channel and email list. I hope this blueprint helps you as you go out and launch your own Udemy courses. Remember, everything is proportional and takes time. I remember when I sent out promotional announcements and only heard crickets. I also remember sending out promotional announcements and making a few hundred dollars. Now, I can remember sending an announcement that netted me thousands. I was in your shoes very recently. Don’t get discouraged. Just keep creating courses, trying new things, and loving what you do.